We have a small number only left ....... time to quit them, well below cost price ...... you will never buy cheaper! 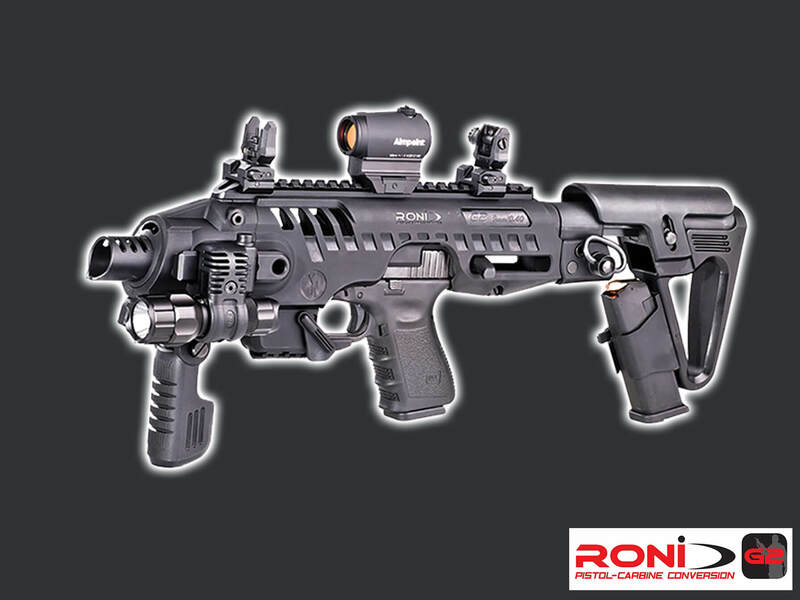 Since being approved by Pistol New Zealand for both 3-Gun, Multi-Gun and Steel Challenge (Speed) shooting, the Roni has proven itself to be one of the most popular platforms for those using Pistol Carbines in Competition, it opened the door for many more "B" endorsed shooters to participate in these events at a price affordable to most shooters. Many Pistol Clubs are restricted in the use of Rifles on their ranges thoughtout NZ and therefore are not in a position to run 3-Gun events, now with the Pistol-Carbine being approved for 3-Gun, these matches can now be shot using the Roni Pistol-Carbine Conversion and shot as a Pistol-Carbine Rifle. The RONI provides you with a better grip and much more stability, now you can use your pistol for a greater range of matches, faster aiming, better accuracy, far greater distance shooting and a platform for many accessories. Gun Supplies Policy: Proof of firearms licence, includes appropriate endorsement, will need to be provided to purchase this item. No Permit to Procure is required. Please note that the following are additional cost items: (You are purchasing a Roni Pistol Carbine Conversion Kit only).